In a future where time travel has been outlawed, a black market exists for anyone with the money, connections, and nerve to request items from days past. As a Runner for one of the underground syndicates that now controls the timewaves, Stassi 2446-89 has seen it all: the fall of Rome, the rise of Hitler, the end of democracy, the establishment of time tourism, and the devastating consequences of it. 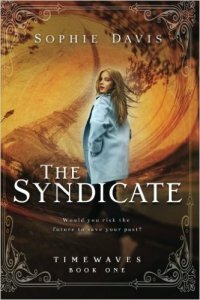 Her job is to seamlessly slip through the past, in search of items of value to the syndicate's clientele. Stassi's next assignment takes her to Paris in the 1920’s, in search of a lost manuscript by one of the twentieth century’s greatest writers. She and her partner, Gaige, are swept up in the City of Light during the height of fashion and culture—as alluring a locale as they’ve ever visited. But a seedier side of life lurks beneath the glamorous façade, and the pair quickly learns this run is more dangerous than any of their previous missions. "Runners studied people, events and cultures, learning to blend within past societies without becoming a part of recorded history. And without causing ripples in the timewaves." Unfortunately for me, it did not live up to expectations. Don't get me wrong, this is not a bad book by any means, in fact it was an easy read. It just was not for me for a few particular reasons. Firstly, it was really wordy. Really. The almost 600 pages could easily have been culled to make a more dramatic and engaging read. Some sections really dragged and others failed to contribute to the plot in my opinion. Pages and pages of nothing solid in contribution, going nowhere fast and so very repetitive. "Even that wasn't enough to combat the neon signs flashing 'Danger Will Robinson?' in my head". Really 'Lost in Space' reference from the 1960s! Would teenagers of today actually get that? I also understand that the main idea was to find a manuscript for a book which had been lost, and that the lead character was trying to work out where the locket that she had been given originated from, in the hope of discovering her birth parents. However, the story just seemed to take forever to get anywhere, and I would lose interest and begin to skim through sections. "Being the mature professional I was, I stuck my tongue out at him." Therefore if you know any young teenagers who are into science fiction time travel tales, this is the book for them. I like the combination of various genres in this story.